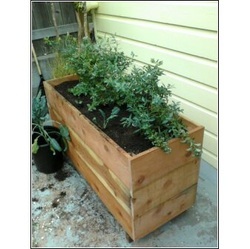 Planter box made from salvaged redwood. Urban Edibles undertakes small construction projects that enhance the function and sustainability of our gardens. Whenever possible, we use locally sourced or on-site resources and recycled or salvaged materials if appropriate. Often, we use the plants themselves to serve as some of the raw materials. For example, a row of bamboo can be used as a living fence, providing privacy, a windbreak and shelter for birds.